Profiles in History Admiral Kirk Star Trek IV Jacket not what it is claimed? 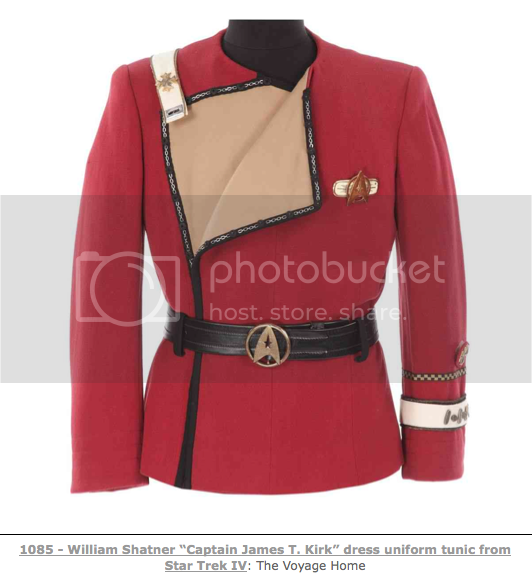 Profiles in History's new auction has a number of great costumes, but the Kirk Admiral jacket, supposedly from Star Trek IV is clearly not. As we have seen in the past, there is just insufficient research. The provenance is noted as Sotheby's, NY 12/18/98, sale 7244, lot 134. The fact that it was previously sold in an auction is NOT provenance. Being sold by an auction house does not creates any legitimacy in the item. We need real provenance. Where did this come from? Who got it and how? Was it stolen from Paramount out the back door as so much was? Was it sold legitimately by Paramount? So we have no clue how this got out, who has owned it and what was done to it. (Note: The Christie's Star Trek auction, or IAW auctions would be provenance as those were studio-sanctioned). Profiles notes: Internal label is handwritten, “Wm S. / 4” for William Shatner. What kind of label? Not a Western Costume label, because Profiles always notes it when it is a Western Costume Label as they do in the OTHER Kirk costume. So this is just a random label? Anyone could have put that label in. This does not inspire confidence. There are a ton of problems with this Maroon..
1) The inner color of the chest flap (lapel if you will) is wrong. Kirk always had a white inside. It is possible that for a scene he wasn't to open his jacket in he would have a different interior, but why? 2) The lapel strap is wrong. 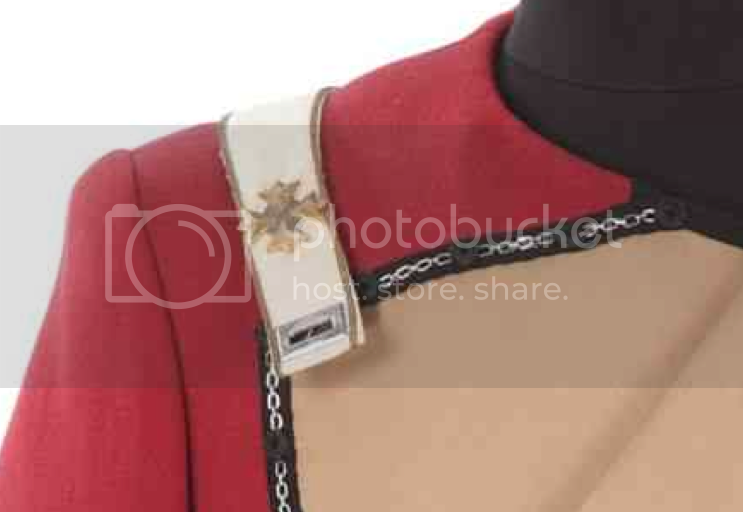 This is CLEARLY not the lapel strap of the Star Trek IV Admiral costume. 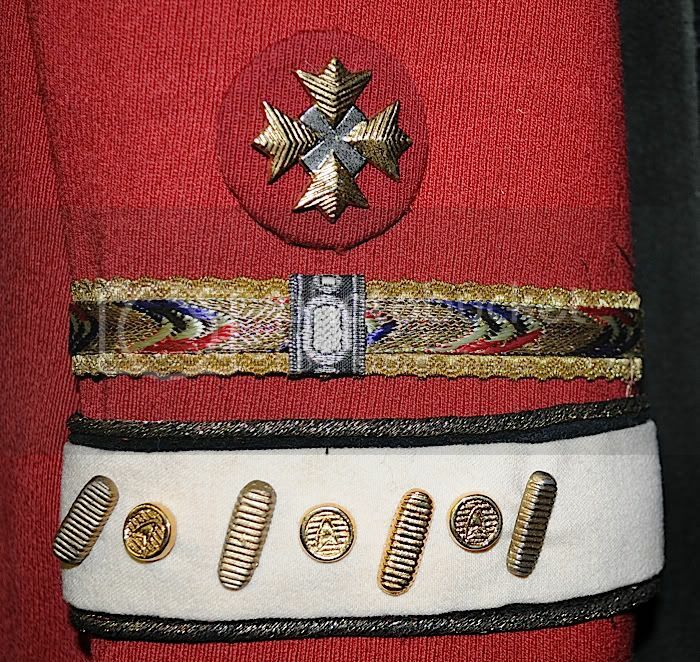 Look at the details around the clasp. The gold striping doesn't match. 3) There is no gold striping around the lapel. This is standard for Admirals and clearly shown in the screencaps. The jacket does not have this gold ribbon. Admiral jackets have a gold ribbon next to the black edge of the lapel. 4) The Admiral braid on the left sleeve is wrong. 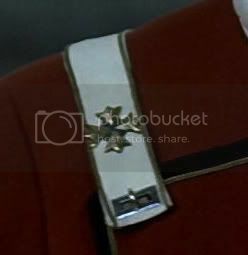 In Star Trek II Kirk's Admiral ribbon was the black and gold checked type that was like what was used in the original Battlestar Galactica. Starting with Star Trek IV they used a thicker, multi-colored and patterned ribbon which also showed the rank by the number of black and gold ribbons stripes crossing the ribbon. Star Trek II: TWOK Note the braid on the left sleeve. Same as the Profiles offering. It's a Wrap sold a number of Rear Admiral Rank sets such as the above one. 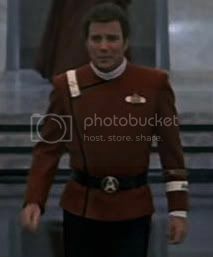 It is clear that Kirk has the updated Admiral braid in the screencaps from Star Trek IV and so the Profiles Kirk is wrong. 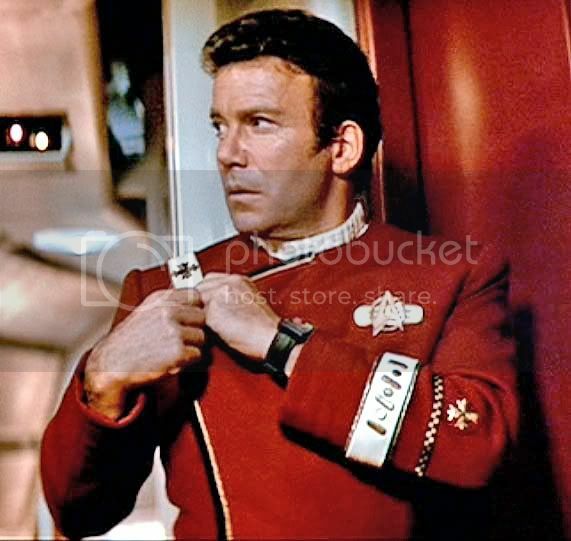 First, there are three seperate scenes in Star Trek IV where Kirk wears a maroon. Kirk wears the same maroon in 1 & 2. The only difference is a different shoulder strap rank (In 1 he is an Admiral, in 2 he is a Captain). The strap indicates it is otherwise the same Maroon. The gold striping is still intact even. It appears this is the same Maroon in 3. I need to do a bit more research, but it would be logical as well. So what is this Maroon? 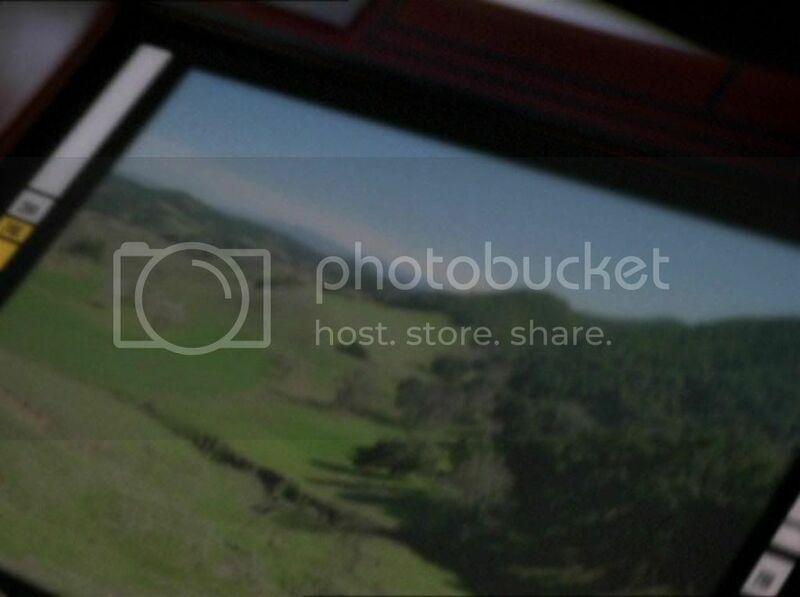 Could it be from Star Trek II? This might explain the left arm BSG braid, but it would not explain the interior flap color. That is CLEARLY wrong. Being that Kirk needed some blood-distressed Maroons for the scene with Scotty's nephew and after, It would be logical there were 4-6 Maroons set aside for Kirk. None would have a different interior. The only thing pointing to this being a Kirk is an interior label that we don't even have a photo of. And a label can be easily swapped out. The interior flap color makes this a non-starter for me. I was initially interested, but won't touch this. 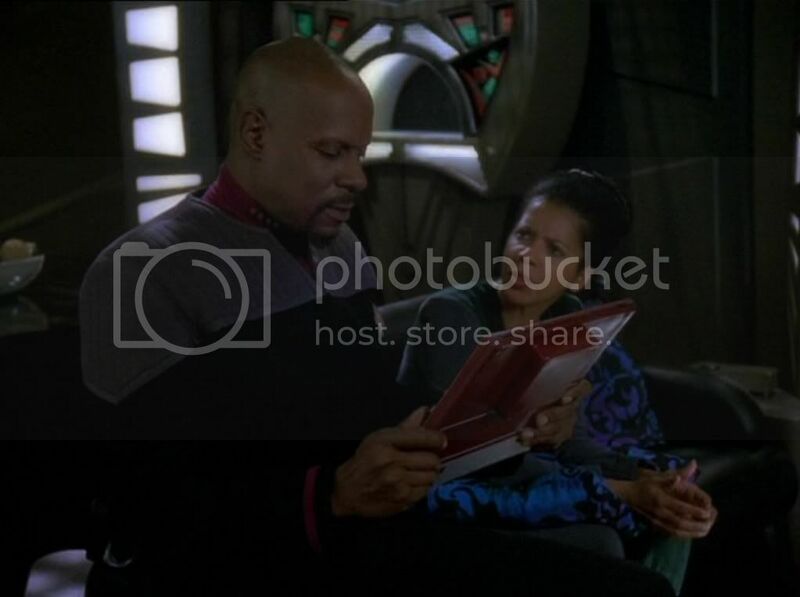 This is Captain Sisko's PADD from the Deep Space Nine episode "Penumbra". It was acquired from Doug Drexler, who worked as Art Director on DS9. 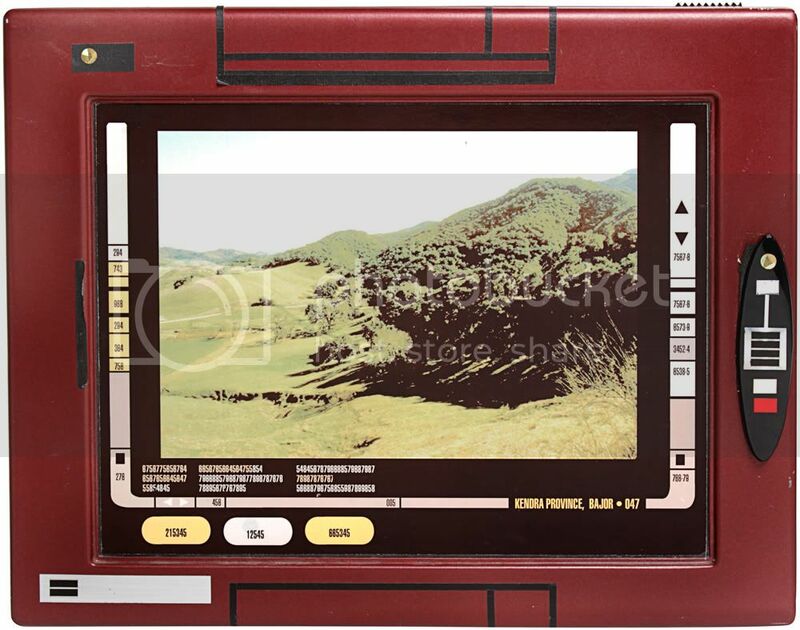 This PADD was seen right at the beginning of the episode. 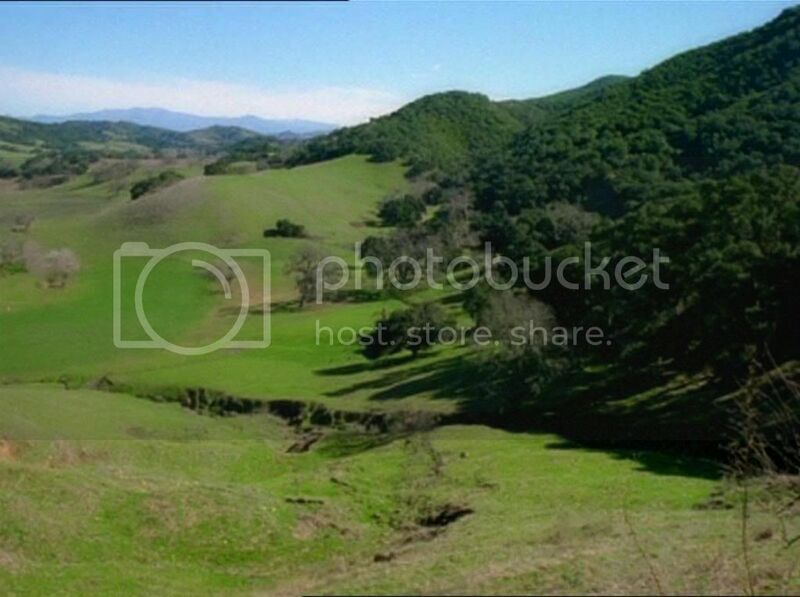 It depicts the land Sisko buys in the Kendra province, south of the Yolja River on Bajor (he bought twelve hecapates, to be precise) where he plans to build a house and retire after the Dominion war is over "and watch the sun set over the mountains every night." 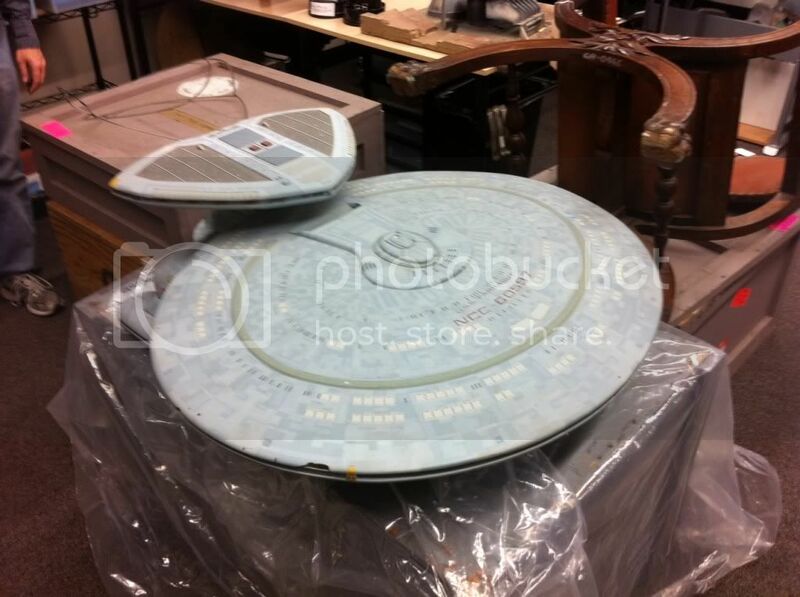 Well, after cataloging all the assets on the Star Trek Exhibits in two locations and emptying one of three warehouse locations, we are starting to get an idea of all the items available for the CBS Star Trek Archive. There are some bigger items we have already tagged for sale that just aren't right for the archive. One of those items is the Enterprise half-missile that was used in the armory set. You can find the IAW listing here. There are 5 of these, as well as a number of full missiles. We have to see if these were production made or they were made after the production especially for the 2002 London Star Trek Adventure, where there was a full armory set. Details to follow. 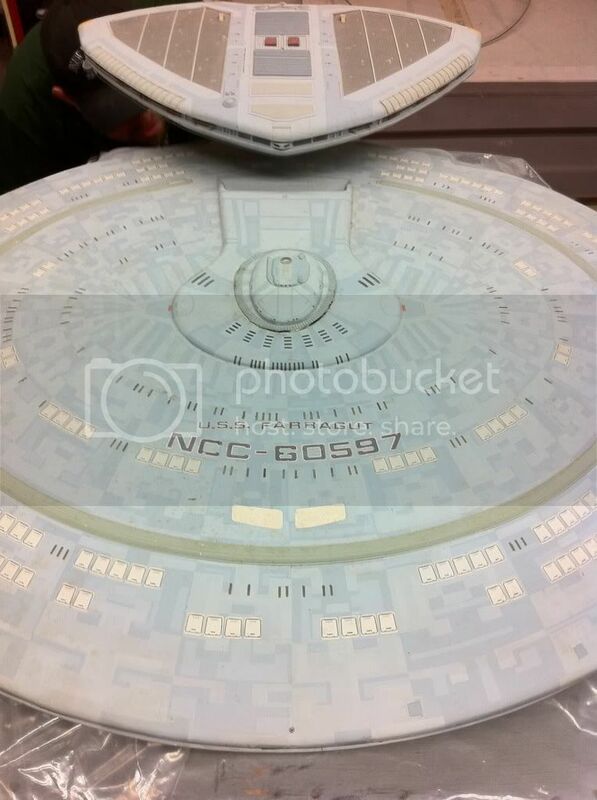 But if you are interested in one, stay tuned, or sign up on the Star Trek Prop, Costume & Auction Forum. 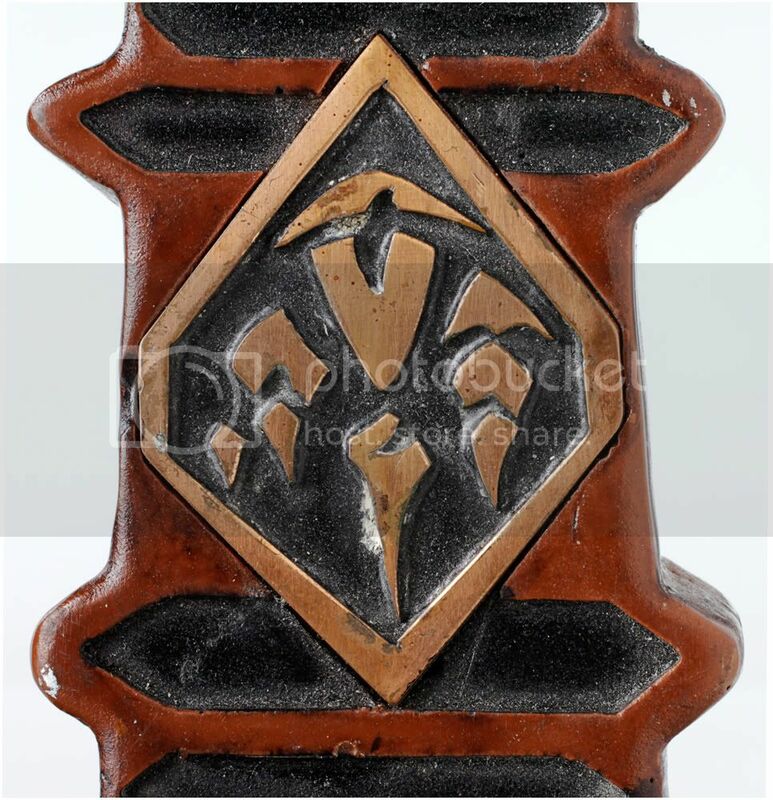 This knife is from the Profiles in History Star Trek auction in 2010. It is a hero metal knife, and the only one I know of. There were 5 rubber stunt knives just like this sold through It's a Wrap and you can find those here. 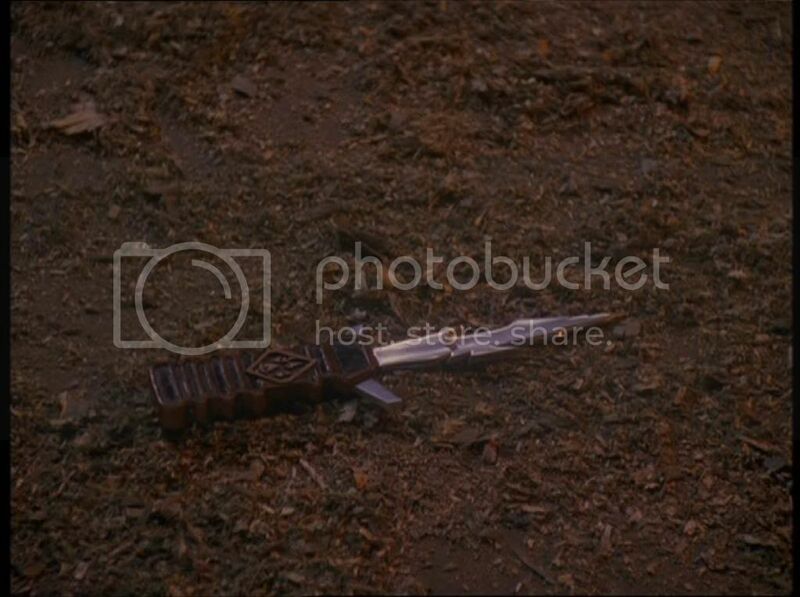 This is the knife used by members of the House of Duras in the early 25th century. 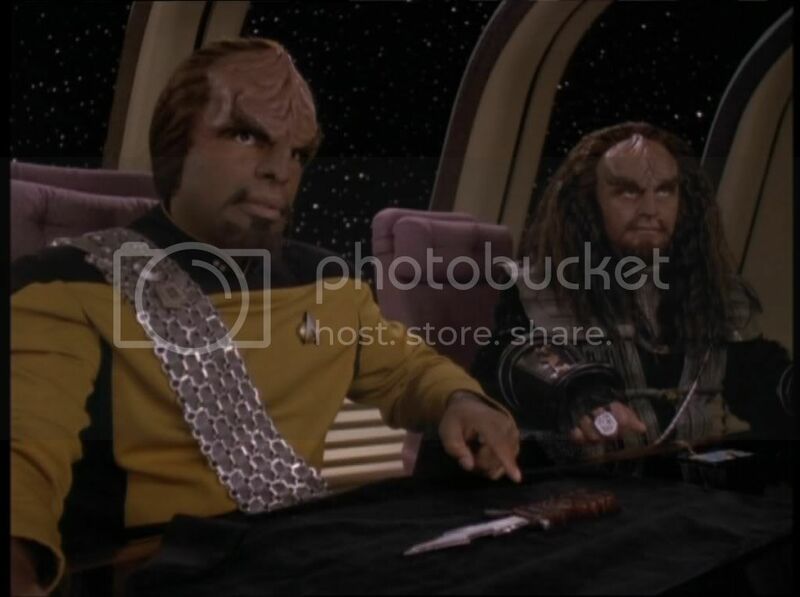 In "Firstborn", Worf and Alexander Rozhenko, while on the Klingon outpost Maranga IV, are attacked by a group of Klingons loyal to the House of Duras. During the fight, K'mtar (actually Alexander Rozhenko from the future) shows up and helps Worf and his son. The assailants flee and one of them drops this knife. As the knife bears the insignia of the house of Duras, it becomes clear that Lursa and B'Etor are behind the attack and the crew of the USS Enterprise-D starts earching for the Duras sisters. When they are found and confronted with the knife, they claim they know nothing of the attack. When the sisters take a close look at the knife, they see that the knife not only features the small symbols representing Ja'rod (Duras' father), Lursa and B'Etor but also a small symbol representing Lursa's son. As Lursa had only learned a few days earlier that she was expecting a child and had not told anybody but B'Etor, it was clear that this knife must have come from the future. It turns out that members of the House of Duras had traveled back in time from the early 25th century to the year 2370 in order to kill Alexander, just like K'mtar tried to do. Thanks to the amazing Jorg Hillebrand for this article and screencaps! 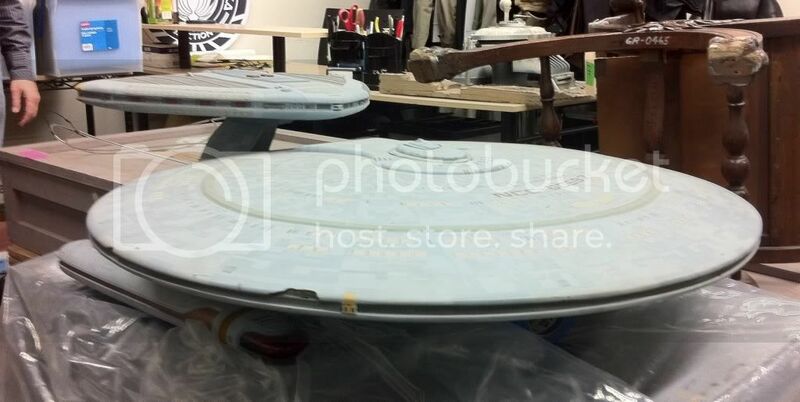 Well, last week we had to clear out a warehouse where there were Star Trek: The Exhibit assets. I would say 90% of the stuff there was wall panels and displays that were no longer usable. But there were some gems. This baby is in need of a lot of work and a serious restoration, but it is cool none the less. The Nebula class is my favorite ship of all the ones I saw on the Star Trek Exhibit and so I am fired up we get to house this for a while.